Carole Arlene Hodges Lucas, 70, passed away on Tuesday, April 9, 2019 at Liberty Commons in Benson. 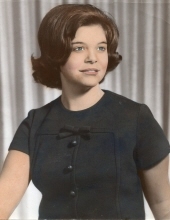 Carole was born in Lenoir County on May 1, 1948 to the late Alan and Dollie Mooring Hodges. She had worked as a registered nurse for many years. Graveside services will be held at 2:00 p.m. on Thursday, April 11, 2019 in Evergreen Memorial Cemetery on Hwy. 70 West, Goldsboro. The family will greet friends immediately following the service at the cemetery. Carole is survived by her daughter, Lori Lucas Bohl of Clayton; grandchildren, Hunter Hobbs and Joshua Hobbs; nieces, Larisa Deaver and Patricia “Evy” Puzzo; and several other great nieces and nephews she loved very much. In addition to her parents, she was preceded in death by her sister, Mary Cox. In lieu of flowers, the family suggests memorials be given in her memory to National Kidney Foundation, 30 East 33rd Street, New York, NY 10016. To send flowers or a remembrance gift to the family of Carole Arlene Lucas, please visit our Tribute Store. "Email Address" would like to share the life celebration of Carole Arlene Lucas. Click on the "link" to go to share a favorite memory or leave a condolence message for the family.